LAST MINUTE: April 20-27, 27-May 4-$1417 ! June 1-8 - $2,520!!! Across Street From Private Beach: Gulf Views: Bob Sikes Cut! April Special Rate! Across the street from the beach. Obstructed Gulf Views (trees, houses) from the second floor, which still very nice. To access the beach we need to use boardwalks, which installed between every 5-7 houses. So you will need to cross the street in front the house, turn on the right or left (does not matter), pass 2-4 houses and you are on the boardwalk. It is a short walking distance, 3-4 min for young/middle age, 4-5 min for older. Plantation has miles paved bike path. Bob Sykes Cut (One Of The Best Fishing spots) is minutes away from our house. Our Plantation is 24/7 gated community, which hosts two large swimming pools. Upstairs kitchen, dinning room, living area, full bath, two furnished decks and screened porch provide a great place to enjoy a views of the Gulf. Whole upstairs area has a beautiful open floor plan with Vaulted Ceiling captivating into full picture window. The kitchen is completely furnished with dishes, microwave, grill, ice maker, pans, coffee maker, blender, etc. You can enjoy the view of Gulf while preparing your meal. The Bay side screened porch provides a great place to enjoy any evening. The Palms is pet friendly home. The downstairs has four large bedrooms (2 of which are masters), 2 baths, and the living area. Each bedroom is provided with a queen size bed. Three bedrooms have TV. Our guests have easy access to the pools and tennis courts provided by the Plantations. We have several bikes, beach chairs, toys and wagon in our storage. You are welcome to use them when you stay in our house. The natural beauty that surrounds The Palms Retreat offers all sorts of entertainment: Enjoy watching the birds during the day with binoculars. We provide a handbook so that even the beginning bird watcher can learn about birds. Also watch the planets and stars with our telescope in the evening. An early morning stroll at the beach is almost a guarantee to see dolphins put on show for you in the Gulf. It's not uncommon to see them swim up as close as 150 feet to the shore, and you will certainly be impressed by their power. The sidewalks in the neighborhood offer a great opportunity to jog, bike, roller blade, or walk. The island is also a great place to catch up on your fishing, either from a boat or the coast. We are located 10-15 minute walk along the beach from the rocky canal at the Northwest end of the island that is known as a prime fishing spot. Please visit our home page to learn more about the house. Amenities:4 bedrooms/3 baths, 2 master suites. Bed sizes: 4 queen, 1 sleeper sofa. Washer & dryer; fully equipped kitchen; 4 TVs, 2 VCRs. Outside hot/cold shower, fish prep area, charcoal grill. Relax in chair of our furnished sun decks. Wonder at some of the most fabulous stargazing you may ever witness. You will enjoy a 'dark sky' that reveals magic Milky Way views. Fishermen and nature lovers adore this beautiful, natural, island setting featuring 26 miles of sand dunes, sparkling gulf waves and abundant bay waters. Park style grill and fish cleaning table provided for outdoor enjoyment. Or let the local adventure companies to take you on boating, biking or fishing adventure. You will love it. 2 furnished sun decks, 1 screened porch, bikes, beach chairs, community pool, tennis courts, and more. You are welcome to take a look at our own site below and to learn more about our house! We deeply admire the beauty of the Island. We always feel better when we spend time exposed to nature of this unique place. We are sharing our house with our guests and we want them to feel comfortable in our house. We hope they will enjoy the nature's beauty of The Island and our private unspoiled beach. Our house located within The Plantation which is nature wonderland for those who loves to explore the outdoors. Neighboring houses are not right up against each other and you will have a sense of seclusion. The Plantation beach is unspoiled, not over crowded and clean. It is a quiet family beach... The wild life and fishing is simply amazing. You won't believe the number of different types birds, butterfly you will see on a daily basis. An early morning stroll at the beach and it is almost a guarantee to see dolphins put on show for you in the Gulf. Our private gated community has a unique partnership with the State of Florida that provides us access to one of the most pristine maritime forests on the island, known as Nick’s Hole Cove. This unique state-owned area is accessible for kayaking, hiking, picnicking, and observing the natural world. The island is also a great place to catch up on your fishing, either from a boat or the coast. We are located in 10 minute walk along the beach from the rocky canal at the Northwest end of the island that is known as a prime fishing spot, Bob Sikes Cut, where you can fish off the jetties and see Little St. George Island across the water. We hope you will enjoy the nature's beauty of The Island, our private unspoiled beach, two large community pools, miles of our biking/walking trails. Take a short walk to our private beach and wiggle your toes in the sugar-white sand on our beach. Swim in crystal waters of The Gulf., or relax at the large pool. At night watch for shooting stars or just listen to the night ocean sounds. If you want to be on the water, you can kayak, swim or spend the day on the boat. You can rent all sorts of water craft at Journeys and other places. They also have guided sailing and fishing trips and much more. Play. Rest. Dream. Enjoy. Welcome to The Palms Retreat! You will be pleasantly surprised by our pristine white-sand beaches and calming waves. Also because we are on The Plantation our beaches are private. They are opened for owners and their renters. We have nice water, Gulf view. But it is obstructed view because we have trees and houses in front of us also. Two AC units serve the house. Each floor has a separate AC unit. Two units serve the house. Each floor has a separate unit. There is a washer in the house. SInce this is a one family house, the washer is only yours to use. There is a dryer in the house. Since this is a one family house, the dryer is only yours to use. We subscribe internet service featuring up to 80 Mbps download speed and up to 10 Mbps upload speed. The company is using fiber optical transmission. One set for each guest. Washer/dryer available to keep them fresh. Bring your own beach towels. The house has 4 flat TVs which have Amazon Fire TV or Rocu 3500X sticks, configured to provide you with our complementary subscription Amazon services. Living room tv has cable box. This was a beautiful property that provided us a much needed vacation. The home was beautiful, well kept, clean and stocked with all essentials needed in the kitchen. The owners were very responsive to any questions we had and easy to get in touch with. We spent the time taking multiple trips to the beach (just a short walk away) or relaxing and playing board games on the top floor overlooking the water. We will definitely be returning in the future. We are glad that your family had relaxing time on the Island. Welcome back! St George Island is great! Great house, great location, great vacation. This was our third visit to The Palms in the last few years, and we have already made our plans to come back again in October. We had some concerns coming in December, soon after Hurricane Michael has hit Florida Panhandle. Luckily, St. George Island had minimal damage, and The Palms vacation house weathered it fine. Our reservation was not cancelled, and our trip did happen as planned. The owners have provided us with pictures and relevant updates about the situation on the island around that time. The floor plan at The Palms works very well for us. It is much better than at many other houses. That is one of the reasons we like coming back to The Palms when we can. We specially like upstairs living/dining areas with nice view of the Gulf. The screen porch on the Bay side of the house is perfect in the evenings. They recently renovated, and now have new vinyl floors on their second floor. As during our previous visits, the house was clean and ready when we arrived. Their shed outside got few additions, but it basically has bikes, beach chairs and toys that we used during our stay. Great house, great location, wonderful owners - We love our time at The Palms. Thank you, Valarie! We are very pleased that you had a great vacation and you will be returning this upcoming fall! See you soon! - We feel that we described the location of the house accurately. We also provided the map and we published over 30 photos of the house, both exterior and interior. There are photos showing how the house is elevated and exterior stairs, which have been very usable by many. - You mentioned that "PLUMBING-WATER BACKUP IN TUB AND TOILET". During your stay you have never reported this problem. If you would reported it, we would have sent the plumber to fix it. - We do not advertise an enclosed shower. We do have open outdoor shower, and it is usable and in a working condition. - Our interior spiral staircase is built according to specification and code. It is sturdy and safe. - Yes our carpet in the living room needs to be replaced and this work is scheduled for November. - We do not have control over County Mosquitoes Control schedule. Sorry that you found them disturbing, but all island experiences this. If you would address your requirements before or during your stay we would be glad to help trouble shoot the above problems. Only problem of concern was the fact there was no sleeper sofa as advertised! There were 9 of us and we had counted on that sofa! And yes there was a blow up mattress by it would deflate within an hour or two leaving someone literally on the floor! Not good! The kitchen was well stocked with utensils etc. and the beds were comfortable! Didn’t like having to drive to swimming pool! That was a little inconvenient! It was a beautiful area and the pool and beach was great! Loved the privacy! Overall we enjoyed our stay! We are delighted to hear that your trip to St. George Isl. was a pleasant visit. We apologize for the inconvenience with the blow up mattress and miscommunication about sleeping sofa. Please come again. We enjoy having repeat guests. The house has everything you need for a fun, family vacation. It's clean and comfortable and the owners are responsive. The location is perfect, very close to the beach. Thank you very much for taking time to review our house. Welcome back! Thank you, Elizabeth, for taking time to review our house. Welcome back. You will not find high rise condominiums, congestion, or crowds. Swimming, shelling, fishing and sunning all await you here; if you want a peaceful getaway, this is the place to be. Wonderful seafood restaurants are located on the island and in nearby East Point, Apalachicola, and Carrabelle. Also, enjoy nine miles of scenic beauty in St. George Island State park located at the eastern end of the island. Please take a look at this map. Leisure Lane is banding towards The Gulf and brings our house very close to The Gulf. And this is where you want to be. We are also very close to Bob Sykes Cut. About 10 minutes walking on the beach. It is a very well known and one of the best fishing spot in Panhandle Florida. Only Plantation owners and their guests could fish their. St George Island Lighthouse and Museum, Play Ground, Apalalachicola National Estuary Research Reserve, (ANERR) a delightful hands-on Museum, Apalachicola Maritime Museum, Soon to have the Jean Mary Paddleboat tours: WWII Museum Musuem in Carrabelle, St Vincents Island , nearby St. James Bay and Port St. Joe provide beautiful Golf Courses... While those who prefer to be on the beach, others can enjoy a round of golf or shop. 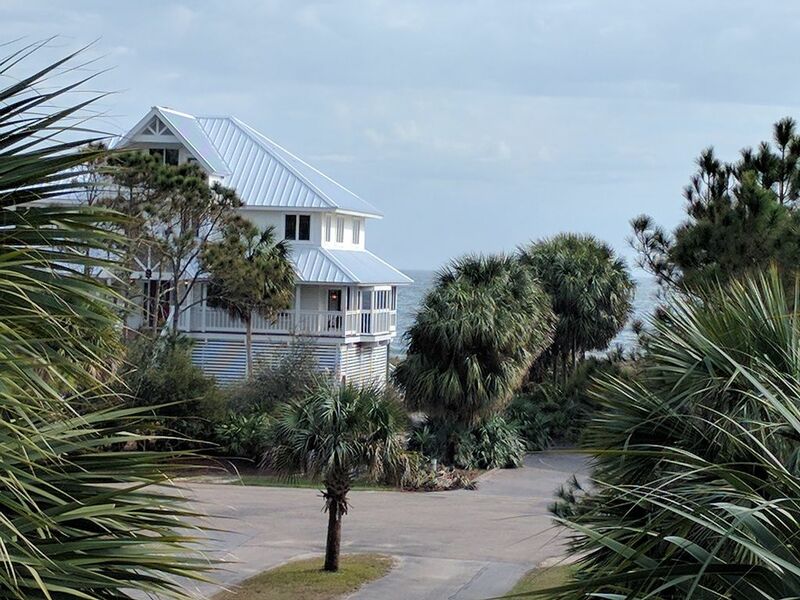 The Plantation has 3 tennis courts, a pickleball Ct, 2 Club Houses and Pools, beach volleyball, Scalloping, Explore Several near by Islands and quaint towns. Apalachicola shopping, dinning and scenic river tours. Make reservations to sail on a sloop with the Maritime Museum or soon the paddle boat the Jean Mary.. Formerly owned by movie star Debbie Reynolds. Number of guests (adults and children older 3 years old) in the party is limited by number listed on the inquiry/Rebtal agreement. This would include all daily visiting guests. Any additional visitors must be approved in writing by owner. Add $ 20 per night, for each additional guest above standard occupancy of 8 people, up to 10. Pets are allowed only on a pre-approved basis during reservation. We allow up to 2 medium size dogs with advance approval for an additional fee. Pet Fee is $75. Special events permitted by arrangement only; separate contract required. Normal turn days requirements are Saturdays (arrival/departure), but off turn days bookings are considered in the slower seasons and for last minute bookings Please check with the owner. Military/Repeat Renter discount - 5%, not 4th of July week; 7 nights minimum. Can not combine with Special Deals. Rates are subject to change without notice. Specials can only be applied to new reservations and can not be combined with other offers or discounts. Monthly rates are available, please inquire. Monthly stays consist of 28 consecutive nights. Special events permitted by arrangement only; separate contract required. Please refer to our Rental Agreement for our cancellation policy. Guests younger than 25 and large groups must interview with property owner and are subject to paying a higher deposit.